His Excellency Prince Stefan of Liechtenstein became the Ambassador of Liechtenstein to the Federal Republic of Germany in 2007. 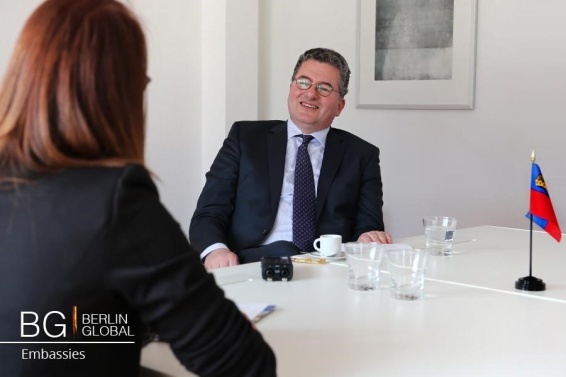 A team from Berlin Global had the honour of visiting the embassy in order to gain a better understanding of the relations between the two states. During our visit we had the pleasure of discussing a variety of different topics including the cultural life of the embassy, Liechtenstein’s relations with the EU, and the current relations between the monarchy and the public in Liechtenstein. Your Excellency, you had the pleasure of representing your country as the Ambassador to Switzerland for six years, and since 2007 you have been the Ambassador of L. to Germany. Considering that Switzerland is the main partner of L., in your opinion is it possible to compare these two different appointments? And what has been the main focus of your work in each of these two countries? Thank you for coming to our Embassy. There is a difference certainly between Switzerland and Germany. From our point of view they are both our neighbours. We have two neighbouring countries, that is Switzerland and Austria, and Germany is just 45-50 minutes away. It is the same cultural and language area and we belong to the same cultural circle. The bilateral relations between these three neighbour states are extremely important. Our diplomatic relationship with Switzerland started a little bit earlier in 1944, in comparison we only opened an embassy in Germany in 2002. So we started from a different point. We have one hundred bilateral agreements more or less with Switzerland, and with Germany I negotiated the very first one in 2009 and then another one in 2011. They are both very close because Germany and in particular Berlin is becoming so important in Europe. You also have had experiences in the private sector. Do you think these experiences are helpful to you as an Ambassador? I think yes, because an embassy in a bilateral relationship demands a lot of creativity and the smaller the country the more creativity you need. I am glad that I have my experiences from the private sector, in banking and in tourism. Also I had to deal with artists a lot in my former life, and all of these things were extremely useful. My experience in the financial sector certainly was very useful, because I had to negotiate tax agreements and I know about it from a real world perspective. So in my case it helped. Also it gives you confidence. I do not know if it is true, but some colleagues say that embassies today are a mixture between a marketing company and a tourism agency for ministers. In our case it is not true. How have the relations between Liechtenstein and Germany changed over the years and in what way is the Embassy of Liechtenstein in Berlin promoting your culture? It is not the first time I have been asked this question and to be honest when I hear such a question I fall back several hundred years. We in Liechtenstein see relationships in a very long-term view. Maybe this is a special element of a monarchy. Our Head of State has been in office for one generation at least. Liechtenstein as a country has been called Liechtenstein for 300 hundred years, but the territory had always been part of the Holy Roman Empire together with Germany. Today I think we have the most intensive relations in recent times. We have extremely close links in terms of economics, many L. companies invest in Germany, the largest company in L. is a German company. All these things are extremely helpful. Sometimes the business is faster than the states, and sometimes the state can assist the business world. Obviously the fact that we have the same language supports the relationship. Considering the cultural relationships you can imagine that promoting the culture of a country like L. in Germany, which is two thousand times bigger than L., is an endless story. You are always out of money, always out of resources and so we try to have another focus. Our focus is the artists. It is what we can do to help especially young artists in all the sectors. This is our main goal. This morning I read something that Michelangelo said when he finished the Sistine Chapel “Art does never belonged to a country, it comes from Heaven.” We are very lucky that we have an active cultural life with lots of traditions and we have many associations, clubs and it is quite an intensive life. We are presented in the two major book fairs, Frankfurt and Leipzig, and this is a chance for young writers to see the big world. How would you summarise the quadrilateral meetings of German speaking countries? Now L. is also a part of these meetings. Is this helpful in deepening the relationship between the two countries? Yes indeed. The quadrilateral meetings take place in various fields and various levels including the Heads of States, certain ministries but also in very hands on sectors like that of the education sector on a working level, and the regularity of this really helps to deepen the knowledge about each other. In normal circumstances Heads of State or ministers do not have the time to talk to each other in an informal way and this formula helps. In 2010 the first official visit by the Head of State of L. took place here in Berlin. How would you evaluate this visit? That was a very interesting visit, we tried to do some research while we were preparing for the visit. We found out that the last official visit had taken place quite some time ago in April 1939, making it difficult to compare. So this visit was important for us and it helped a lot. It also helped to facilitate many meetings with other ministries in the same year and it brought L. back to the official Berlin life. Liechtenstein is part of the EFTA and the EEA, also the Schengen zone which means that it has full access to the EU’s Single Market. Is there any intention from Liechtenstein’s side to become a member state of the EU or is there any pressure on L. to join? I think we can absolutely say that we are perfectly happy with the situation as it is now. It fits to our size. It is completely supported by the people, the companies and the economic life which has benefitted a lot. As a double strategy we entered the EEA, but at the same time we maintained our close relationship and custom union with Switzerland. So we are part of two economic areas and for our companies this is the best starting point. Switzerland is an extremely stable neighbour, we have been using the Swiss franc currency since 1919 and it has helped our industry a lot, which is exporting almost 100%. The EFTA group, including Switzerland has so many free trade agreements, it has significant support. Also in the cases where only Switzerland has a free trade agreement, Liechtenstein is part of these agreements because of our custom union. This is of course a major advantage to our export market. For example with China the relationship is increasing which is fascinating if you think about the size of the countries. In academic studies if you read about BREXIT, they usually mention the model Liechtenstein has with the EU as a possible association model for the UK in the case of a situation where citizens of the UK vote to leave the EU in the Brexit referendum. What is your opinion? To be honest I just do not want to think about this case. It is really difficult to calculate the risk of a BREXIT. It is an emotional thing, there is no academic resource showing that leaving the EU would be extremely positive in one single sector. I have difficulties to understand this situation so I do hope that Great Britain will remain within the EU. I think we are also extremely connected. And then if you think about the role of the financial market in London, it would cause a little earthquake. Liechtenstein and Great Britain have a lot in common, our national anthems have the same melody, we have a monarchy and our Heads of State know each other very well, we share the same view on the relationship between state and citizens and also the philosophy of self-determination is very similar. Geographically Great Britain will always stay where it is. Although we are not members, I like the EU and I know it would suffer a lot from this. The constitutional amendment of 2003, strongly supported by the public, confirmed the already existing duties and powers of the monarchy, which have since 1921 given the Head of State an indirect veto right. How do you think this law is reconcilable with the unique concept of direct democracy? First of all as you mentioned this constitutional law was adopted by the vast majority of the voters, 64% of the people in 2003. And there was another referendum four year ago also on this subject, let's call it veto right - it is not exactly a veto right, I call it an indirect veto right - and in this referendum more than 76% voted against any changes. It is showing, that it is directly legitimised by the people and it is a very significant example for our constitutional reality and structure. It is the two sovereigns, the monarch and the people, which need each other. This direct democracy is a very powerful instrument, also with regard to the relation to the Parliament and to the Government. It means that members of the Government and Parliament always have to stay in direct contact with the people not to have too much of a distance. In case of a new law you just need one thousand signatures and you can start the process of a referendum and it can be very embarrassing. Because of this the monarchy is still up to date in our time, especially in combination with this strong direct democracy and with the possibility that people can always vote against and abolish the monarchy. It works well, maybe because of our size. We do have some citizens who want to abolish monarchy, but as you can see from the results, which were a real test, the attitude towards the current system is very positive. To understand we have to go back in history. After the First World War the country was extremely poor, it could not afford to buy food from Switzerland, so the Head of State sold all the family jewellery and he gave the money to the state to be able to buy food. During the Second World War again the Head of State had a very important role so we did not lose confidence that it would turn out well, he was very convinced that Liechtenstein would remain sovereign. After the Second World War, when we started from zero, Princess Georgina, the wife of the Head of State, founded the Red Cross and she was in the first front helping refugees so this built up a special relationship. In 2009 Liechtenstein improved transparency within the banking sector following the suggestions of the OECD. Are there any noticeable effects on the financial service sector following the tax information exchange agreements? Since 2008 there has been an increasing desire to improve transparency in the financial sphere, in particular in tax matters and at the same time there was a financial crisis so we had a complex situation. The banking sector has changed a lot since 2008-2009 and if you look for instance at the banking sector in Germany it is not the same as it was 7 years ago. What we can see is that those financial institutions which have adapted to the new situation faster benefited much earlier. Since the beginning of this year, a multilateral agreement for automatic exchange has come into force. But the whole sector in Europe is still suffering from the events of 2009. There has been an increase of regulations, with negative effects on the cost side of banks and we might see further changes in the banking sector in the whole of Europe. During the negotiation process of those agreements you were the ambassador. What are your experiences? It was extremely interesting because the Government nominated me to be the head of the delegation, for these negotiations and I am not a tax expert. So from one day to the other I had to read a lot of papers about tax agreements and be very creative. You can imagine that on the other side, from the German Finance Ministry they were all experts. The ratification process was also as interesting and as demanding as the negotiation, for instance we had hearings in the Parliament in the Finance Commission. Now our economies are benefiting a lot. In Liechtenstein 2 out of the 5 members of the government are female, including the Minister of Foreign Affairs. How well represented are women in Liechtenstein politics and what kind of example do you think L. is setting for other countries? 2 out of 5 is not bad and in the diplomatic corps of Liechtenstein, 3 out of 8 acting ambassadors are also ladies which is also not bad. However, hopefully it will increase in the future. Unfortunately the parliament does not look as good because our parliamentary system is a voluntary one, so you are not working full time and also you are not paid a full time salary, you do this in your free time. We are very lucky because boys and girls have the same chances, there are absolutely equal in rights. There are some things that all European countries face, for instance that the pay levels are not the same and women in exactly the same position are not paid the same, and this is a bit embarrassing. What advice would you give to young people who are interested in pursuing a career in international relations or diplomacy? It depends on whether we talk about young people from our country or from other countries. From Liechtenstein it is not difficult. I would certainly advise that they should consider an internship at one of our embassies, like my colleague who is currently undertaking an internship now. We usually have the smallest embassies in our host capitals and that has an advantage because we do not have different departments, in our case you can see everything. Certainly we have a very active political life in Liechtenstein and I think one element when you are interested in diplomacy is to be active, to be interested, participate in regular discussions about politics, international relations. In larger countries a diplomatic career is not a very easy one, it is exciting, it has a certain prestige, but I tell you that this career can be extremely tough, also for the families and for the married partners. I think it is great that some countries try to improve the situation for the partners, like Switzerland: the present ambassador here in Berlin, she was in Bangkok before and she shared her post with her husband. I think it is a time we live in today where we do need diplomats more than in the past 20 years. We do need more efficient and effective diplomacy, if you look at all the dangerous situations around Europe. And we need more support from the people for this international commitment. 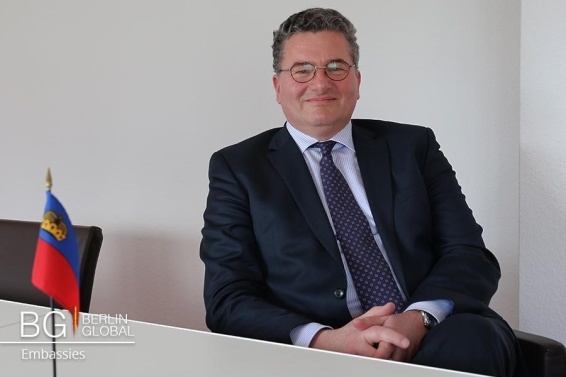 At the end of the interview, His Excellency the Ambassador was kind enough to present us with the project “Liechtenstein Languages.” It promotes a very efficient language teaching method developed in Liechtenstein. The goal is to enable refugees to speak German and so improve their chances in the labour market, highlighting that language is the key to integration.